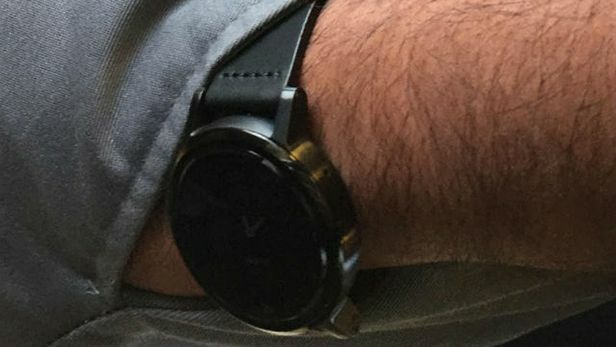 The sequel to the Moto 360 hasn't even been announced yet, but it seems as though Motorola employees are already using the new smartwatch. It's been spotted twice this week around the streets of Chicago, which happens to also be the hometown of Motorola's North American headquarters. The first leak (pictured) comes from Gerrit Gödecke, a commuter who posted two photos he took on his iPhone to his Google+ account, showing an all-black model. The second photo was posted online by a Reddit user, showing the new Moto 360 with a dark red band that matches what we saw in the accidentally tweeted promo video. This time though, it shows a rose gold face rather than silver. While it's impossible to verify if these are the real deal, both images match what we've seen leaked already, including new strap lugs as well as the repositioning of the right-side button that's now been moved to the 2 o'clock point. If it is what we think it is, then it certainly looks promising. With the new timepiece seemingly done and dusted, it seems likely that we're going to hear about it soon. Motorola's next big chance to unveil it would be at IFA 2015 which kicks off September 4. The world had high hopes for the first Moto 360 but, while it stood out from other smartwatches for its stunning design, it was criticised for its poor battery life and underwhelming chipset. Can Motorola duly deliver this time around with a worthy rival for the Apple Watch? Time will tell.